Our Customer Support Service Include Benefits like Order Fulfillment, Product Queries, Order tracking, Documentation and Payment Queries, Subscription Services, Query Resolution etc. Our Customer Support Service include Benefits like Email Technical Support, Inbound and Outbound Telephone Technical Support, Inbound and Outbound Customer Service. Intecreus Customer Service and technical support service provides support to customer by giving a quick and accurate customer response. Our Outsourcing Customer Support helps to achieve this goal by dealing with volumes of such response and providing enhanced value services to customers as per their specific requirements. 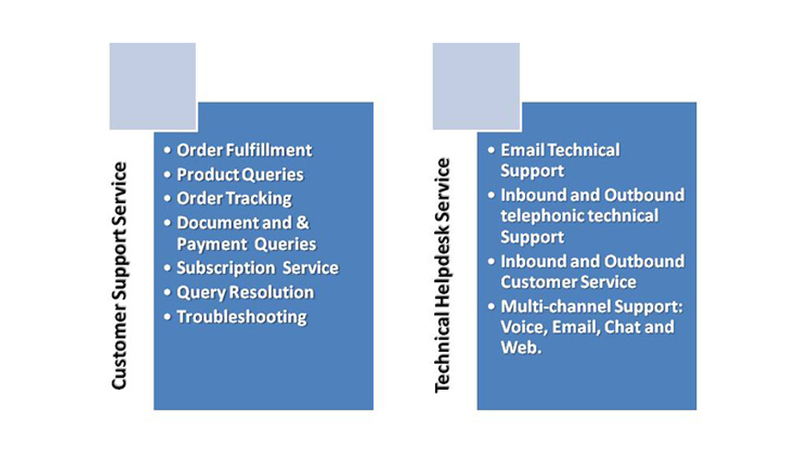 Query Resolution, Response to Inquiry or Feedback, Subscription Services, Product Inquiries, Order taking, Documentation & Payment Queries and Intecreus technical Helpdesk Support is a center of providing excellent, quality Technical Support and BPO Services to IT organization globally. Our Technical Support BPO solutions include, E-mail Technical Support, Inbound Telephone, Technical Support, Inbound Customer Service Telephone Call Support with tier 1 and tier 3 Support to our customers. Intecreus Provide 24/7 Customer Support Service Facility for the customer projects for proper work flow and quality customer feedback. Customers can get full and accurate information for their products and services. Intecreus Provide 24/7 Technical Support and helpdesk Support for their problems. We helps customers to resolve their issues with proper troubleshooting service provided to them.